Do you have a store front I can visit? No. To keep our costs down, we keep all inventory in our online shop. If an item you want is out of stock, simply contact us and we will make it for you at th esame price. Keep in mind that most woods and acrylics will be one-of-a-kind due to nature and how the acrylics are mixed. We will come as close to what you see in the picture but have no control over nature. I have a pens I want to sell. Do you buy pens? Nope. There are plenty of stores that might purchase a pen that you have. We are in the business to make custom pens and not have other manufacturer’s pen lines on consignment or purchase. Do You Really Make Each Pen? Will you repair pens made by other manufacturers? No. Reason being is that first, I didn’t make the pen. Second, the parts other manufacturers use to make their pens are most of the time proprietary to them, so I don’t have access to their parts in order to repair your pen. However, you can always contact the manufacturer through their website and see if they have a repair division and send your pen directly to them. What Woods Do You Use? I generally use only exotic woods due to their superior color, grain and overall look. My favorite woods are Amboyna Burl, Cocobolo, Red Mallee and Box Elder Burl. How ever I also use Crotch Walnut, Maple Burl, American Holly, Pernambuco, Texas Mesquite, Texas Ebony, Grenadillo, Spalted Maple, Bethlehem Olive Wood, Crosscut Brazilian Cherry and Wenge. What is So Special About Exotic Woods? That’s simple. I do not like to alter the color of woods with stains or tints. The exotic woods I use all get a clear coat which brings out the natural beauty of the wood. With many domestic woods the colors are ok, but the grain patterns aren’t up to my standard. My pens are each a work of art. I look at them as a painter would looks at his individual pieces and I make my pens accordingly. The burls and grain patterns of exotic woods along with their natural color produces a magnificent pen that will not only be one-of-a-kind due to nature, but it will be a conversation piece whenever it is used. How Durable is the Plating On Your Pens? The plating on our pens is pretty close, if not exact match, to that of the other high-end pen manufacturers. The parts are plated using the rack method and that small amounts of cobalt or palladium are added to the plating chemicals. This enhances the durability of the gold plating. The tumbled method, which we do not use, produces an inferior gold plating and is less costly. This method produces most durable plating. This process is called PVD (particle vapor deposition). Titanium nitride matched to the color of the gold is molecularly bonded to the part and then 24K gold is bonded (sputtered) on the part to achieve a color match to our other gold parts. The parts are again re-plated after this. The final result is that the parts will virtually never wear. This is an extremely durable plating. Under normal use this plating should hold up for many years. This is a very durable hard plating. We use real platinum rather then rhodium and it should be expected to hold up under normal careful use for many years. This is titanium oxide molecularly bonded (PVD). This plating is unbelievably hard and durable. It will last for many, many years. What Type of Refills Do Your Pens Take? I get this question quite frequently. 99.9% of my pens will take either a Parker Style refill for the ball point pens or a Schmidt 5888 refill for the roller ball pens. My fountain pens come with a dual option of either an ink cartridge or an ink pump. No matter which pen you purchase from King Pens, any office supply store near you will have a refill for your King Pen! Primarily, my pens will come with black ink. I have had customers who preferred different color inks as well as gel inks to the standard ball point ink. I have yet to hear any complaints that they were not able to satisfy their preferred ink needs. Do You Sell Pen Ink Refills? No. Our pens take either a Parker style refill, a cartridge for fountain pens, or the Schmidt 5888 Rollerball refill. These can all be easily purchase at your local Office Depot. Why are your pens larger than standard pens? After many years of writing with what I refer to a sub-standard pens, I felt it was necessary to raise the bar and hopefully eliminate, or at least greatly reduce, hand cramps and writing fatigue. With a fatter pen, your hand is free to write without the need to grip it for dear life! Our pens have a nice weight and write beautifully. Customers have told me that my pens feel better than any other pen they own. I think you will find that King Pens are a true innovation that will bring enjoyment back to your penmanship again. Do I need a Paypal account to purchase your pens and is it secure? You do NOT need a paypal account to purchase from King pens. I use Paypal primarily because they are a trusted and realiable credit card processor. Your transaction through them stays with them and is not stored on this site or its servers. The only information I am proivided with is your name, mailing address, item you purchased and status of the order so I can send you updates and tracking information. Bottom line, your transactions are safe and secured through Paypal. What shipping do you offer? I prefer to only use USPS Priority Mail. I am not as big as Amazon where I can offer a guaranteed two day delivery like Prime, however, I also know the anticipation of wanting to get your product as soon as possible. So as a FREE option to my customers, I offer FREE Priority Mail anywhere in the 50 states of the USA! Foreign orders are set up a bit differently. I do have to charge shipping on all overseas orders and will work with you to find the best and most economical way to get you your pen ASAP. What do I do if I drop my pen and it breaks, then what? I can repair any pen that I made which you own. Simply contact me with the issue, we will arrange for you to mail the damaged pen to me and I will repair it for you. However, my warranty does not cover accidents. You will be asked to pay for repair materials and labor involved. My turn around time is usually 2-3 days and it will be back in the mail and on its way back to you! Can you repair a pen made by another company? No. I can repair my pens because I have access to parts to replace my line. Your best bet would be to hunt down the manufacturer and see if they will help. Can you make a completely customized pen if I send a picture of what I want? No. What you see in our shop and the various models we offer is what we can make. We do not have a jeweler on staff to custom make a pen out of solid precious metals or add gemstones. We have spent years finding the very best quailty parts to build our pens and we stick with what we know to be true and of the best quality. If you really want a custom pen made, there are those who can accomplish this for you, however be prepared to pay 20X -30X what my pens cost. If you find a style of pen we sell, but do not see a material that you would like, say another wood or colored acrylic, we can see about hunting down just about any material (wood or otherwise) and make that dream a reality. Bottom line is we want customers loyal to our brand and our pens. We will do what we can to maintain your happiness and satisfaction. ©2018 All Rights Reserved. 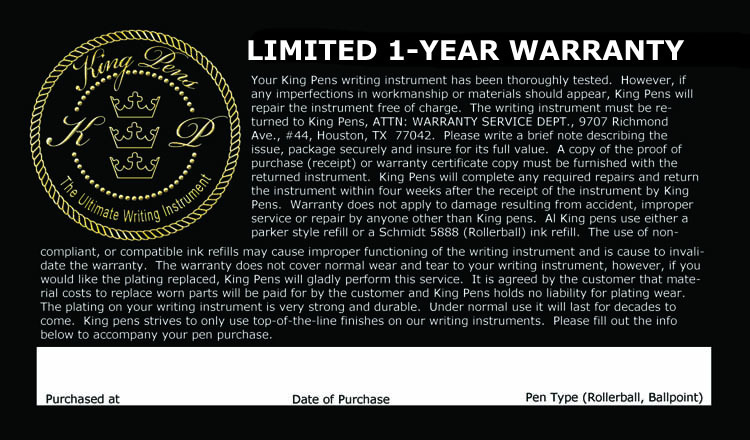 King Pens and its logo is a Registered Trademark Company.